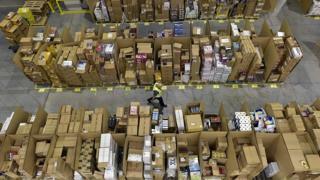 Amazon and eBay are profiting from sellers who defraud UK taxpayers by failing to charge VAT, according to a report by MPs. The report estimates up to £1.5bn has been lost from third-party sellers on online marketplaces not charging the tax on sales they make in the UK. MPs in the Public Accounts Committee criticised HMRC for being "too cautious" in pursuing the "fraudsters". Amazon and eBay said they were working with HMRC on the issue. Labour MP Meg Hillier, who chairs the committee, called online VAT fraud "hugely damaging" for British businesses and taxpayers. She added that "the response of HMRC and the marketplaces where fraudsters operate has been dismal". The fraud has increased because foreign firms selling goods to UK shoppers - usually via online marketplaces like Amazon and eBay - are keeping some of their stock in UK warehouses to provide next day delivery. If items are dispatched from UK soil, the sellers have to charge VAT at 20%. But many have not been, so undercutting genuine UK suppliers and reducing tax revenue, the committee's report found. Brexit will make the issue more complicated because of uncertainty over trading and customs, it added. Both Amazon and eBay told the committee they took action to remove "bad actors" from their sites. But the report said it was "bewildering that these big companies have taken such little action to date". It added that Amazon and eBay, amongst other online marketplaces, "continue to profit from fraudulent activities taking place on their sites" by charging the sellers a commission. In the hearings a pack of lightbulb socket converters and a hose for a Dyson vacuum cleaner were held up as examples of products sold without VAT. HMRC said it had introduced new rules last year to hold online marketplaces liable for unpaid VAT by overseas sellers, leading to a ten-fold rise in the number of sellers registering for VAT. "The new reforms will secure an extra £875m in tax to help pay for vital public services," an HMRC spokesman said. In a statement Amazon said it was reviewing the report and supported efforts to ensure sellers across all marketplaces were VAT compliant. An eBay spokesperson said it was going "above and beyond" HMRC's requirements to provide a "fair marketplace for all our buyers and sellers".